In its campaign to call attention to social inequities, the Occupy Cincinnati movement (OccupyCincy.org) has targeted Fifth Third Bank, a local bank that was bailed out by the federal government. The group asks Cincinnatians to take their money out of Fifth Third and move it to a not-for-profit, member-owned credit union on National Bank Transfer Day, Nov. 5. 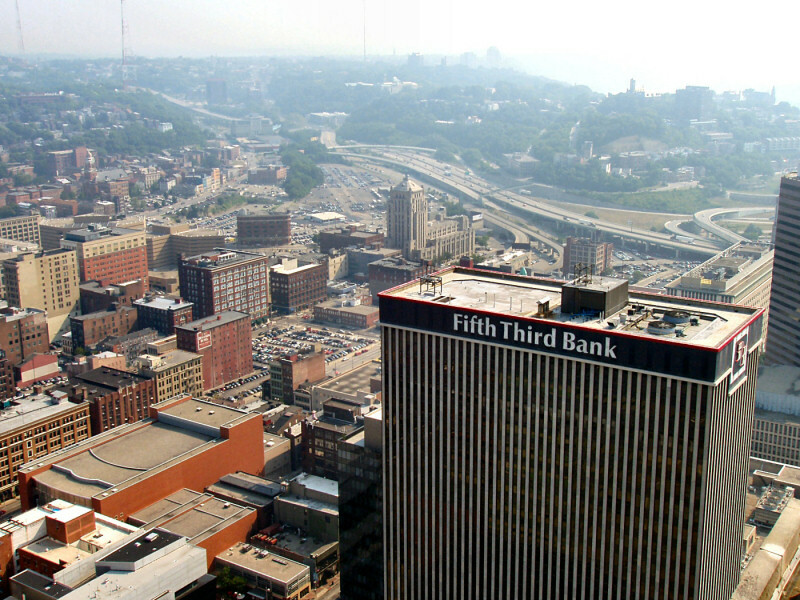 At one of its general assemblies, Occupy Cincinnati voted to target Fifth Third Bancorp both because it is a locally based regional bank and because it was one of the 17 largest bank bailouts in the country. Fifth Third was also chosen because of its role in illegally attempting to influence local governments and because of the accusation that it had defrauded customers. We are talking about a big bank here. Fifth Third Bancorp is a Cincinnati-based regional bank serving states in the East and Midwest. It has about 50 affiliated companies, over 1,300 locations and employs almost 21,000 workers. It is the nation’s 18th largest bank. Last year Fifth Third had total assets of $115 billion and revenues of $1.6 billion. Fifth Third has more than doubled its profits in the past quarter, earning $373 million. That is the total after preferred dividends of $8 million were paid to stockholders, according to the Cincinnati Business Courier. Like other banks, Fifth Third was put in danger by the 2008 financial crisis. That year, several large New York banks failed, mostly famously Bear Stearns and Lehman Brothers, as well as the government-sponsored financial institutions Fannie Mae and Freddie Mac. Many other banks were near collapse. President George W. Bush stepped in to save the bankers with the Troubled Asset Relief Program (TARP), estimated at $432 billion. President Barack Obama and the Democratic Congress continued the program. Fifth Third Bank received a $3.4 billion dollar bailout from the U.S. government – that is, from taxpayers. TARP created rules and regulations for the banks that were bailed out, rules to prevent bankers from exploiting the bailout for their own benefit. But a 94-page report by the Special Inspector General for the Troubled Asset Relief Program painted “a picture of favoritism, strong-arm tactics and secret changes in repayment rules to help the banks,” according to The Cleveland Plain Dealer. While under the Troubled Asset Relief Program (TARP), bank officers’ salaries were reduced by law, but Fifth Third and other banks evaded the law by offering what was called “phantom stock.” In the case of Fifth Third, this amounted to $5.1 million paid later to eight top officers. The Special Inspector General found that Fifth Third and others pressured the government to repay early so they could return to paying large salaries to their executives and dividends to stockholders. They repaid their loan with funds raised by the questionable practice of selling stock while they were still in economic trouble. The Inspector General called it the private sector’s equivalent of printing money to pay their debts. The bailout, which was repaid in February 2011, allowed Fifth Third to survive and return to profitability quite quickly. The company made a profit of $753 million in 2010. Fifth Third increased its dividend payments to stockholders from 6 cents to 8 cents a share in September. For stockholders who own thousands of shares, this represented a significant increase in income. Kabat was paid $10 million a year in 2007. After the economic crisis, in part because of the government’s rules, his compensation fell to $5.85 million. He also owns $4.7 million in Fifth Third stock and earns dividends on that stock, according to Forbes. And he has other jobs. He is also a member of the board of UNUM, an insurance company with $9.9 billion in revenues. He is doing better than most of us, to say the least. Fifth Third Bank’s Political Action Committee and Fifth Third Bank board members and executives donate hundreds of thousands of dollars to political campaigns. The 5/3 PAC and bankers have given hundreds of thousands of dollars in political contributions, mostly to Republican candidates, but also to Democrats. In the 2004 election cycle, the bank gave almost $80,000 to Republicans but less than $16,000 to Democrats. It gave a few thousand dollars to the campaign of U.S. Sen. Rob Portman (R-Ohio) but also gave some money to U.S. Sen. Max Baucus (D-Montana). One of Fifth Third Bank PAC’s favorite candidates has been the ultra-right wing U.S. Rep. Jeannette H. Schmidt (R-Ohio). Fifth Third PAC has given her several thousand dollars. Contributions by individual Fifth Third bankers amount to hundreds of thousands of dollars, primarily to Republicans. Fifth Third PAC targets its contributions to the senators who make decisions crucial to the bank’s interest. Baucus, for example, sits on the Joint Taxation Committee, a matter of no little importance to the bank. Not all of Fifth Third’s political contributions have been legal. Fifth Third engaged in illegal practices that forced the bank to pay a $1 million settlement to the Securities and Exchange Commission (SEC) in 2002. Two unidentified Fifth Third Bank officials reportedly gave political contributions to candidates for local or state governments in Ohio in violation of the SEC’s municipal bond “pay to play” rules. The two officials made 13 such illegal contributions themselves and one from the Fifth Third Political Action Committee. The Cincinnati Enquirer reported that Fifth Third never admitted wrongdoing but paid the $1 million settlement. Fifth Third has also had other sorts of legal problems. Last year the bank paid $9.5 million to settle a class-action lawsuit for the allegedly fraudulent, unfair and illegal assessment and collection of excessive overdraft fees. Fifth Third Bank is doing well; the profits are rolling in. How is its hometown doing? The official unemployment rate in Cincinnati stood at 8.7 percent in September. But most authorities believe the official rate underestimates discouraged workers and the underemployed, so real unemployment could be twice that high, more like 18 percent. African-American and Latino unemployment is generally estimated at twice that of whites – closer, that is, to about 36 percent. For youth, the unemployment rate is 40 or 50 percent. We have in our city tens of thousands of people who cannot find work, many of whom have exhausted or are close to exhausting their unemployment payments. Consequently, according to this year’s American Community Survey, Cincinnati is once again on the list of the 10 poorest big cities in the United States. We’re seventh out of the 10 poorest, with 30.6 percent of residents living in poverty. Median household income for whites in this city is $46,615, while for African Americans it is $22,216. The federal government sets the poverty level for a family of four at $22,050, so we can say that many in our city live on the edge of poverty. And many have fallen over the edge into the pit of poverty. Hundreds in Cincinnati have lost their homes, thousands throughout the state. Greater Cincinnati has, according to the last count, almost a quarter of a million residents without health insurance. Some health situations are critical. African Americans continue to have an infant mortality rate in Hamilton County of 18.7 per 1,000 births compared to 6.3 for whites. Fifth Third, then, can be said to represent many of the things that are wrong with the American economy, society and politics. Enormous wealth accumulates in the hands of a small number of the bank’s board members, executives and largest stockholders. The bank uses that money to invest in other banks, insurance companies, industries and services and grows wealthier, while Cincinnatians and other Americans are growing poorer. The bank’s financial contributions allow it to influence politicians and to shape government policies in the interest of the bank and its continued profitability. Gallion says that Occupy Cincinnati will be urging Cincinnatians to participate in National Bank Transfer Day on Saturday, Nov. 5 (http://www.facebook.com/banktransferday). This national day of action was only launched Oct. 7, but immediately found a following, resonating with Americans’ disgust at the banks and the bailouts. When the Fifth Third Bank action was announced, many Occupy Cincinnati members had concerns about what would happen to the bank workers. What would happen if National Bank Transfer Day actually led to a falling off of accounts and deposits and to layoffs of bank workers? What is the situation of bank workers now and what would be their situation in the future? Bank workers’ salaries are low. Bank workers in Cincinnati earn an average of $36,000 per year, though tellers, the people you meet at the bank window, earn an average of only $20,000 per year. This is a wage of just under $10 per hour The national average in 2008 was only slightly higher at $23,610, according to the U.S. Bureau of Labor Statistics. Credit union workers earn similar wages. In the United States, less than 1 percent of bank workers have a union to represent them, while in other countries in Europe and Latin America, all bank workers are organized in unions. Brazil, for example, recently experienced a national bank workers’ strike leading to a new contract and higher wages. Organizing unions in the United States, however, has been difficult. When labor unions recently announced they would attempt to organize bank workers because of the bailout of the banks, the bankers brought in anti-union consultants to prevent unionization. The goal of the Occupy movement is to change the balance of economic power in our country, to create a more democratic and egalitarian society. Occupy Cincinnati believes that, by starting with a campaign against Fifth Third, it can lead Cincinnatians to think more critically about the role of banks in our economy, society and politics. National Bank Transfer Day gives Cincinnatians an opportunity to begin to create a new society through the small step of moving their money from for-profit institutions to cooperatives.